We seem to have reached that point in the year where the constant burning swelter has broken my spirit and, also, sapped my will to live. Everything is covered in sweat. I’m sweating. When I hug my boys, they are covered in sweat. My hair appears to be sweating. And this is inside of my air-conditioned house (not that we can afford to set it to some crazy temperature…like 79…). Last night I was wearing a pair of cotton ankle socks, and I had to take them off because I felt so warm I was getting sick. I remember, in December we installed a fan in our living room. We turned it on to test it out, but quickly turned it off again in alarm as helicopter-force winds disarranged the room, actually lifting small objects from their places and moving them around. “Wow,” we said. “I don’t think we’re ever going to use that setting.” It just goes to show how wrong you can be about some things. Any task requiring concentration – like this blog post, for instance – gets put off and in many cases forgotten by my heat-muddled mind. (I think it’s been two or three days since I started writing it.) We have reached the point where I can’t remember being chilly, and strain my brain though I might, the prospect of cooler weather in the future seems unlikely ever to occur. We are totally going to freeze when we go to Japan this February. Freeeeeeeeeeze. Listen to that word, though. Just the word is refreshing. Freeeeeeeeze. Freeeeeeeee-ze. Free-zuh. Free. Greg and I are both just waiting to get out of here. He has a snowboard in the garage that has been collecting dust for three years, I have a love affair with sweaters and long-sleeved shirts that has been put on hold for the same amount of time. As a crocheter and a knitter (by the way, crocheters, check out the Interweave Crochet fall preview. Kim is working wonders over there! ), I am nothing short of thrilled at the greater range it’s going to offer for my skills. Most of all, though, I look forward to being able to think comfortably again. Nothing keeps the mind alert like a healthy dose of cold weather! I made that for Max this week. Little tip, if you tell a three-year-old what you’re making for him before it’s finished, he’ll try to get it. Because, apparently, he doesn’t care if it doesn’t have wings, or a windshield. Good to know. The airplane is shown slightly larger than its actual size, I think it’s almost three inches long. ← It’s Curtains for You! I appreciate the sentiment – we’ve been blessed with 2 nights of cool weather to sleep by. You might try crocheting fine little snow flakes and see if you can fool your mind into thinking it is winter!? I love the airplane!! You should post your pattern!! It would make a great church or other quiet time toy!! We must be twins. I hate the hot weather too. In fact when I find myself complaining about the cold weather in January, I stop and make myself remember that hot sweltering stiffling heat in summer. Yeah makes me savor that cold weather even more! Chunky and I have mastered “air hugs” where we hug without touching for hot nights when I tuck him into bed! Wow, someone else who hate summer, too. I can’t believe it. People always give me the wierdest looks when I tell them I hate summer. I hate hot weather. I’m kinda looking forward to winter but it’s so cold here in Saskatchewan that I just really look forward to Fall and Spring. 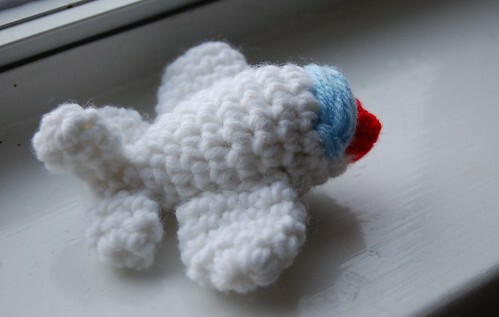 Anywho, that is the cutest little airplane. You are the awesomest mom.